Thanks for the compliments... But we really should get back to the topic at hand, alright? The cruddy map's not worth us neglecting our job here! Great map Neobie! But you forgot to put the country where the US Americans live. Asia shifted over 1000 miles west! And South Africa is now an archipelago! Oh, and it seems I now live in 'The Iraq'! well today is Dec 7th and TAR Crew and flags were reported in Asuncion, Paraguay international airport today. See twitter thread for reference. Por otra parte, y como mostramos ayer la fotografía revelaría a la pareja eliminada de la competencia; una señora de unos 70 años junto a una joven, tras las pruebas que se realizaron en la zona lacustre de Pto. Varas. On the other hand, and as we showed yesterday (me, mariamindy, couldn't find the article) the picture reveals which couple was eliminated from the competition; an old woman, about 70-years-old and a young lady, after all the tasks that took plane in the "Vargas Port" lake area. Or something like that, I hope it helps. And of course (reference only people living in "The Iraq" would get) the little upside-down broken-ankle-shaped country next to The Iraq should be called "She-bang-a-bang". Thanks, Mariamindy. That article was discovered several days ago and was discussed in detail elsewhere, so that's why nobody reacted to it. Keep looking, the more eyes watching, the more likely we'll find where they've gone to. Just something I remembered that might help in trying to find leads online. The first time I can recall that a local article was published that was uncovered was in relation to TAR 4. A local newspaper published an article in Dutch, with photographs of the cheese/wooden shoes detour option (and Reichen was in the photograph. 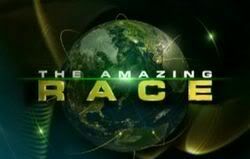 It wasn't picked up initially because the words "Amazing Race" was not used; IIRC, the Dutch words was used. It might be helpful to see if foreign language equivalents show up with searches. While the English words are much better known now than then (TAR didn't have much European exposure except through AXN), I'm speculating that with all the blogs, tweets and other sources, there may be something worth mining. I think we should focus in searching the words "race" "competition" "teams" and the like. I feel it's very unlikely that people who don't know of the show will use the word "Amazing"
So, we should be seeing teams back in the US sometime in the next week, right? Didn't someone say filming was to wrap around the 20th? Does anyone know how Jeff and Jordan are doing? In the race? Check page 1 of this topic .. if you really want to know. Glad I wont have to get hooked on ANOTHER reality show! It really depends on the day teams fly out of the Seychelles. If they're headed into Penang, they could make various connections through Johannesburg, Dubai or Mauritius, then through Singapore to Penang. I'm saying it's too early to call before we know exactly which days they were there. CBS says teams will travel 40,000 miles through FIVE continents and EIGHT countries. I'm 95% certain they didn't visit Paraguay and had two countries in Europe instead, based on CBS's press release.